While playing a game of ‘Blind Man’s Buff’ with his child friends on his Birthday, ten-year-old Everett loses his footing and tumbles down a large steep hill. From here on, a fantastical dream-like adventure begins. In this surreal world, Everett encounters a pompous Lyrebird with unreasonable paradoxical questions, the eccentric Queen Star, Cassiopeia as she conducts the odd beauty lesson, The Hanged Man who only views everything from an upside down perspective, a disgruntled Cane Toad and his large possession of antiques, and in the strange case of mistaken identity, Everett, himself being confused as Goldilocks by The Three Bears, as well as a plethora of other bizarre characters in strange and amusing situations. Source: Thanks so much to author Leigh Belrose for providing me with an e-ARC of this book! When author Leigh Belrose emailed me asking me to read and review her book, I was very excited, but at the same time a bit skeptical. I don’t normally reach for books like this, but her warmness and book’s intriguing synopsis lured me in, and I expected a good read. Though this book did have some great things about it, it all goes back to the genre that is not my favourite. I liked, but didn’t love this book, but that doesn’t stop me from recommending it to other readers with different preferences. 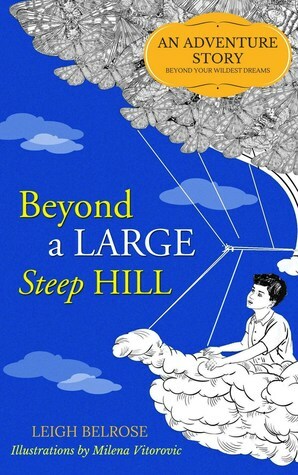 For a brief summary, Beyond a Large Steep Hill is about a young boy named Everett, who accidentally tumbles down a hill while playing a game at his birthday party. Most would expect pain and suffering, but what Everett experiences is a great adventure full of new friends and fairy tale-like characters. The protagonist of this story, Everett, wasn’t so memorable to me. I feel like this book was more plot-centred than character-centred, which was fine, but I still love a well-crafted, strong main character that I can relate to. There were also many other interesting characters, but now after I’ve finished this book, they feel like a big jumble to me. The plot was also a big mish-mash of events, which, agreeing with other reviewers, didn’t have too much of a flow. They didn’t connect at all- once one event finished, it was never revisited, making it seem like an entirely new story. The events were fun and mystical, but I still would have appreciated just a tiny bit of a connection between all of them. This book for sure still has many positives to it, though! I absolutely loved the writing and imagination put into this book. For this reason and others, I know that it has the potential to become a favourite of many prospective readers. Overall, I liked Beyond a Large Steep Hill. I really did, but its flaws made it hard for me to look at it as a favourite. Honestly, I feel like this book would be better suited for 8-10 year olds, possibly even for a younger age if they are mature and strong readers. As for young adult fans? It’s a happy, wondrous, refreshing read, but if you’re looking for depth, then maybe take a look past this one.